I have three email accounts, and it's a nuisance to check each one. I also have trouble keeping my address books in sync, and when I'm looking for a certain message, I have to check in three places. Is there an easy way to consolidate all my email accounts in one place? I understand your dilemma. 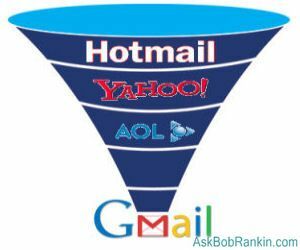 For various reasons, people often end up with multiple email accounts on several hosts: Hotmail, Gmail, Yahoo, AOL, etc. It gets confusing and hard to keep track of. It also takes a lot of time to check for new mail on all the services. The good news is that it is possible to consolidate all those email accounts into one, without losing anything stored on the other services. You'll probably want to keep all your email accounts active and receiving mail, at least for a while. Those addresses are out there and if people don't know your new address, they have no other way to reach you. But you want mail sent to Yahoo, AOL, etc., to be forwarded to your One Address. That way, you only need to log onto one place, saving lots of time. Simple is better. I chose Google's Gmail for my One Address. It's reliable. The gmail.com name is a respected brand widely used by both personal and business users. Gmail is searchable in many useful ways, and its spam filter is highly effective. Best of all, Gmail now lets you consolidate all your other email accounts very easily. You could just logon to all your email accounts, and send a change of address message to everyone in your address books. And you should do that, but it won't really help you consolidate everything without a lot of extra effort. Of course you want to import to your One Address all your email contacts from the other services, AND your old email saved on those services. Gmail lets you do all that with a few simple steps. After logging into Gmail, in the upper right corner, click on Settings, then click the "Accounts and Import" tab. Next, click on "Import Mail and Contacts" and just follow directions. One by one, you will enter the email address and password for each of your other accounts. You'll be given the option to import contacts and old mail; import new mail arriving at the old address for 30 days; and to add the old mail address to the imported mail as a tag to tell you where it came from. Click "Start Import" and go do the same for your other email accounts. Google advises you that the import process may take several hours, even up to two days, before you start seeing imported mail. In actual practice, I started receiving imported old mail within minutes. Your experience may vary. But importing goes on without you, you don't even have to be logged on to Gmail. Be forewarned that you will be inundated with "new" mail at your One Address during the import process. This is a good opportunity to review and delete old mail you really don't need, and keep the keepers. Since Gmail has a "filters" function, you may want to set up a rule that routes mail from each old account into a specified subfolder, rather than have everything pile up in your main Inbox. From here on, you have only one webmail site to bookmark, and just one username and password to remember. Email checking will go much faster with only one account to check. And you'll have all your contacts and messages in one place. Most recent comments on "Consolidate Email Accounts"
If you use MS Hotmail you can also forward/receive e-mail from other accounts by selecting 'options' then 'Send & receive mail from other e-mail accounts'. I have an account with AOL which I access through my Hotmail account and it works with no problems what so ever. Good article, Bob, on consolidating e-mail accounts. Thanks. But what Gmail is lacking is a way to consolidate multiple Gmail accounts into one Gmail account. Or, if there is a way, I couldn't find it in the Gmail help files. I'd like to consolidate the filters, labels, and of course, all the messages, from two different Gmail accounts into one Gmail account. And I would like to preserve the labels I have affixed to hundreds, nay, thousands of archived messages. Do you, or any of your readers, have any suggestions? Gmail cant go out and grab email from all webmail accounts. It didnt work with my Mail.com account. I use POP Peeper. It notifies you of mail received and it comes up instantaneously when you click on the icon. No delay. You can configure any number of email accounts in it - and you can delete mail on the server before it gets to your inbox. EDITOR'S NOTE: Gmail's import feature DOES bring in mail from other accounts. That's exactly what it's for! I am confused - why not use an email client like Thunderbird to bring in all this mail? I have 5 or so eMail accounts and use Mozilla Thunderbird to access them all from the one location. I use the portable version which comes with portable apps, run from a USB stick, which allows me to use my eMail with my settings from any computer. The multiple accounts only need to be set up once, and the mail from each account can be delivered to a single local local inbox. Great suggestion. Simple, as you say, certainly is better. People go way overboard with the number of email accounts they use. I've had the same primary email account with Yahoo for 12 years. I use others strictly as "throwaways." The final step that should be added to your article is to use a email client on your PC and use the POP function to download it all. I would never trust my email to a third party for safekeeping. Hi Lee, There in fact, is a way to combine your GMAIL accounts. Use the POP access gmail provides for the purpose. EDITOR'S NOTE: That won't combine the address books, labels and filters, though. Been reading for a while now - great stiff. This one was really useful. Been fooling around with Outlook, Thunderbird, Ypops etc. Pain in the gazoo. This one's simple enough for us wanna-be geeks. I find that an easy way to keep track of all my e-mail addresses is to use Webmail Notifier for Mozilla Firefox. I never have to check manually, other than the occasional bug. Note that it only checks the Inbox and not the Spam folder. "EDITOR'S NOTE: Gmail's import feature DOES bring in mail from other accounts. That's exactly what it's for!" Like I said, GMail did NOT work with Mail.com accounts. But that is moot now -since Mail.com has since been merged with AOL Mail. So it should work now. The best feature in Gmail, in my opinion, is the ability to *send* from various accounts. Once registered (see the settings tabs) you can receive forwarded email from other accounts and send email that looks like it came from those accounts. I use this feature to get my work emails and emails from five different accounts all coming into my main account. Extremely useful. A better setup is AFTER you get everything into Gmail is to then go to each account you collect from and set them to automatically forward all email to the main Gmail address and shut off their Spam Filters . Of course then you shut off Gmail's option to go get the mail and you are relying on Gmails very good spam filter. This method results in faster receipt because email will be forwarded as received instead of waiting for Gmail to request the mail. You can also forward email from any other Gmail account to the prime account. I have been using Pop Peeper at home and Gmail import at work. They both work great! There are many people who for various reasons prefer to use POP mail and a whole generation who have grown up with webmail and don't even know there is such a thing as POP. It might just suit their needs (so 2007 or not!). You say "import new mail arriving at the old address for 30 days". What happens after 30 days? I have 5 mail addresses and use POPTRAY to collect from all the servers, it's free and you can delete anything before it gets to your email program. I have it set to check every 1 minuet and it displays results in the task bar, one click and you can see whats there before they get imported. It doesn't consolidate address books but it's a good defence against spam ect. POP? Talk about 2007. If you're going to use gmail, use IMAP. I forward all email to one gmail account. As far as I can tell only Hotmail balks at forwarding directly to gmail. I make sure all the email is clean, sorted, junk removed and then use Thunderbird once a week or so to download everything from gmail via IMAP (leaving copies on the gmail server). Instant backup, labels and all. Gmail is pretty reliable but never put all your eggs in one basket. The chances of both your pc and gmail dying at the same time are slim. I may be from the old school but I am quite happy with Outlook and have 3 accounts from different ISP's. I use MailWasher to filter out spam. In case I missed or deleted the wrong email, I have a month to go back and remail it to myself. The Pro version allows using numerous accounts. I then get all my email downloaded to my Inbox. This will work with gmail too. I use the Xobni for searching my emails. It's freeware and quite effective. I am thinking of opening a an IMAP account with my main ISP so that I can keep my stuff backed up off-site as well as being able to get to it from anywhere at anytime.